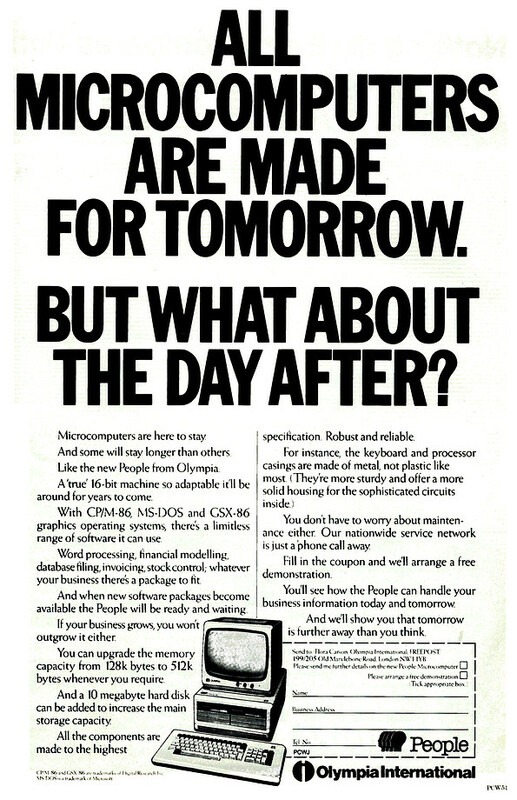 nosher.net - Olympia advert: All microcomputers are made for tomorrow. But what about the day after? All microcomputers are made for tomorrow. But what about the day after? Another also-ran in the micro stakes from another typewriter company - Olympia International. The curiously-named "People" was an 8086-based machine that ran either CP/M-86, MS-DOS or GSX-86. The latter was the 16-bit version of Digital Research's GSX desktop manager that would become the GEM Graphical Desktop, as used on the Atari ST in 1985.